We love cooking with chocolate and here are just a few of our favourites to keep handy when friends drop by. Chocolate Truffles, Creamy Vanilla Fudge with Chocolate and Nuts, Chocolate and Cinnamon Swirl Meringues, the list goes on and on! So easy to make too! All in our absolutely favourite book: Gifts from the Kitchen, 100 irresistible homemade presents for every occasion by Annie Rigg, published by Kyle Cathie. Here is one recipe we make once in a blue moon because it hardly ever is used for what it is intended for … spreading on toast, or as a layer in a sponge cake, or as a topping to cookies. It is so yum it generally gets eaten direct from the jar! Oh well, we have no resistance – do try it! Home baking is having a revival and cooking with chocolate is always fun – the smell is enough to send everyone to the kitchen to see what’s up! Using cooking chocolate is the way to go. We recently made some Cake Pops. The pops themselves were made from crumbed sponge cake mixed with butter cream and then formed into balls. The first coat was a pink candy melt. Then, as an experiment, a coating of Menier white chocolate. We were really impressed with this chocolate, it melted quickly, had a good dipping consistency, and the taste! Well … let’s say we won’t be using anything else in future! Then on with a coat of dark chocolate, again it melted and dipped well, holding the final decoration perfectly. We loved the creamy taste of both the milk and white chocolate, the dark chocolate was pleasantly rich. Ever used chocolate in savoury dishes? Pour half of the olive oil into a large ovenproof casserole dish and heat over a medium heat. Add the lardons of bacon and cook for 4-5 minutes or until crisp and slightly browned, then remove with a slotted spoon and set aside. Put the diced venison in to a bowl with the seasoned flour and toss well. Ensure all of the meat is well coated and shake off the excess flour. Put the casserole dish back over a medium heat. Once hot (you may need to add a little more oil at this point), add the venison in batches and cook until the meat is browned on all sides. Remove from the casserole dish and set aside with the lardons of bacon. Add the rest of the olive oil to the casserole dish and heat over a medium heat, then add the garlic, shallots and celery and cook for 1-2 minutes, stirring frequently. Add the carrots, turnip, mushrooms and herbs and cook for about 10 minutes on a low-medium heat or until the vegetables and shallots are slightly browned. Stir frequently. Return the venison and bacon to the casserole dish and stir gently. Add the red wine and bring to the boil, then add the beef stock and season with the salt and pepper. Bring back to the boil, then cover with a tight fitting lid and transfer to the pre-heated oven. Cook for about 1½ – 1¾ hours, or until the meat is tender. Once the meat is tender, remove from the oven and strain the meat and vegetables though a large sieve, retaining the liquid. Pour the liquid into a saucepan and bring back to the boil. Place the venison and the vegetables back into the casserole dish and cover to keep warm. Once the liquid is boiling, whisk in the redcurrant jelly and re-heat gently. Lower the heat and whisk in the butter and the chocolate. Add small amounts gradually to ensure the chocolate does not split and go grainy. Taste and adjust the seasoning accordingly. Pour the sauce over the venison and vegetables and stir well. Serve with creamed celeriac and steamed greens. If I press my nose up against the glass like this I can almost see through. Looks like two people, and wait, I know that shape – it looks like my best friend Henry, the Labrador! Ah, Claire, I’m so excited, hurry up and open the door! Henry, Henry, Henry. I’m so pleased to see you. Let me chew your ear for a minute, no, I need to jump on you, oh I’m so pleased to see you! Oh Winnie, you have to calm down, ouch, that hurts! Don’t send me to my basket Claire. I just want to see Henry, we usually play this rough, what’s different? Henry, what’s up, why won’t they let us play like normal? Oh, Winnie, it’s been awful. I’ve been so ill. Be gentle, I’ve got a poorly side. Don’t look sad Henry. Sorry if I hurt you, I didn’t know you were ill.
I’ve been very ill – and in so much pain. I had to go the doggy hospital and everything! Oh no, not the doggy hospital! Oh Henry, what happened? I’ve been very silly. But you know how I like to eat stones! Eat stones?! Oh Henry, you’re not still doing that are you? I thought you’d stopped – remember all that fuss last time? I know. I just love them – I don’t know why. Anyway, this time I had to go and have an operation at the doggy hospital. It was awful, I was so scared – and Laura had to leave me there. She was so upset. I felt awful. They put me to sleep and when I woke up I had such a pain in my side – it was better than the pain in my tummy before the operation, but now I just feel sore and I’m not allowed to go on long walks. Winnie … they’d cut me open to get the stones out! I hope so Henry. Really only very small puppies usually eat stones. I know I chewed a couple and Claire always caught me before I could swallow them. Well, I snuck away from Laura and she didn’t see. She’d have given me a right telling off if she knew. After I ate this one, it was a bit big, I had this terrible pain in my tummy. It was unbelievable! I do, but I’ve just got to take it easy whilst my stitches heal. Oh Henry, I’m just glad you’re okay. I wish I knew the answer to this problem, but I don’t! I can make some suggestions and offer a word of warning, but why dogs do this I really don’t know. Perhaps they are bored, perhaps they are inquisitive, perhaps scraps of food from a barbecue have fallen on the ground? Whatever the reason, definitely they are being stupid! Unfortunately, they don’t make any connection between the sore tummy (and possible operation) with eating stones. Dogs live in the moment and would only learn if the undoubted agony happened immediately. However puppies will be puppies, so we must do our best to protect them. Some of the smaller pebbles can pass through, depending upon the breed. It might be a good idea to fence off gravelled areas, possibly spray with bitter apple or some such anti-chew preparation. The word of warning concerns mulch. Please be sure to read the label as some mulch has been flavoured with Cocoa and (as I’m sure you know) chocolate – especially the darker chocolate – can be fatal to dogs. Even if the label states it is safe for dog, it isn’t if cocoa is listed. Greedy dogs can eat huge amounts of this and the consequences can be horrific. Sorry to end on such a glum note, but better safe than sorry. Grow Your Own Potatoes for Free! Thompson & Morgan are offering a fabulous Potato KIT FREE* for every visitor – worth £15.00! What you get in the kit: 5 x tubers of Potato ‘Vales Emerald’ – A Maris Peer/Charlotte cross with an RHS Award of Garden Merit that is proving to be very popular. Potato ‘Vales Emerald’ produces generous yields of oval, cream-skinned and pale fleshed tubers. Perfect for your first potatoes of the year, and a simply delicious as a salad potato. Height and spread: 60cm (24″). 1 x potato planter – Holds approximately 40 litres of multipurpose compost (sufficient to plant 3 or 4 tubers). GO to www.thompson-morgan.com and enter Offer Code: AF11109 in the box labelled “Enter catalogue or newspaper code:” This will ensure the £15 is crossed out and only the postage is applicable. 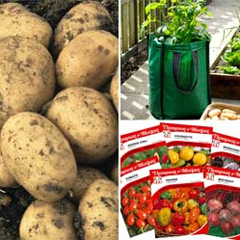 This is a really generous offer – 5 tubers of top quality potatoes, packets of seeds, and a planter bag which you can reuse for subsequent crops, or other vegetables. For instance, we have just planted two lots of asparagus in planters. Such a neat and easy way to grow vegetables, especially plants that need to be kept under control. So if you are interested, don’t delay, apply today! The work of Yohji Yamamoto, the influential and enigmatic fashion designer, was exhibited at the V&A earlier this year, here is a link. The exhibition made it possible to get up close to the exhibits, view from all anglers, examine at the detail, the variety of fabrics, the unusual pattern cutting and then compare other examples of work, a fascinating experience. We spent a happy couple of hours in the various galleries where the work located. Then a fashion show in the Fashion in Motion series open to the public and free of charge, was put on by the Victoria and Albert Museum in July and we had the opportunity to see Yamamoto garments in motion, which is so much more interesting than static models. Laura McClelland, our fashion editor, comments: The show revealed the typically edgy Yamamoto style – both the fashion and the models who were “ordinary” couples taken from the street but far from ordinary once having had a catwalk training session, perfectly complimenting the Yamamoto neo-goth/punk styling of his clothing. I loved the idea of the couples who were so suited for it, whispering to each other as they came down the catwalk. The womenswear pieces shown were a selection of beautifully de-constructed fabrics and shapes that have a fluid movement once in motion. Although Yamamoto is well known for his androgynous look I felt many of the pieces were very feminine with their effortless, subtle tailoring. The men’s pieces were a selection of over-sized tailored styles with some intricate embroidery detailing. The latest Fashion in Motion show was on 18 November that showed the work of London-based label, Peter Jensen. We will let you know when the next show is to be held. The tickets are in great demand so you need to be quick to get one. If you don’t manage to get a ticket the show will be broadcast live on the day. Again we will let you know the link in due course.